Always great service with beautiful flowers :) Would never order flowers from anywhere else! The flowers was lovely ,perfect . Flowers were very pretty, bought for mothers day and mum was very happy. beautiful colours and nicely arranged in a very large bouquet. Absolutely amazing florist, such gorgeous fresh flowers with a fantastic service, will continue to keep using them. Perfect. Always a 5* service from Enchanted! My mum was thrilled with her beautiful Mother's Day basket! Would never use anyone else! The flowers were lovely and the person who delivered the flowers was efficient and courteous. Flowers were beautiful and very fresh, they look just as described in photo on website. Prompt delivery and the recipient loves them. Beautiful flowers, and delivered without fault! Excellent service. Daughter loved her flowers. Great flowers, delivery was perfect, highly recommend! I am quite impressed with their service. I ordered the flowers in Valentine's day (morning) and they were able to deliver on the same day :)Highly recommended. Best florists in Cyprus, great flowers and service! Exactly what was ordered, delivered on time. will use them again. Really pleased with the excellent service. I am in the UK and I booked flowers for Tala in Cyprus, the price was reasonable and according to my sister the flowers just delivered are gorgeous and the driver was very professional and nice too, thank you so much! Mum loved the flowers I sent her for her 70th. She even asked where they were from as they were so fresh and beautifully arranged. Delivered without fuss to Tala. I'll be using them again for sure, as will she! Great quick service with attention to satisfying the Customer. My daughter was delighted with her xmas bouquet which arrived on xmas eve, even when it was a last minute idea and we were informed it may be after xmas when it arrived. The flowers were not all the same as in the picture, which again we were informed as it was a last minute idea, however the bouquet was full of flowers and thoughfully chosen with a Scottish twist with thistles and heather, which my daughter was very pleased with. I also didnt quite get the address right either but the florist went out of their way to track my daughter down so that she received it. So thank you Enchanted! Great service. Delivered on time and what was expected. I am delighted with your service and more importantly, my sister was completely thrilled with the flowers and the phone call to ensure she was there to receive them. They arrived at the perfect time on the day I selected - will definitely be using your service in the future. Thank you. I was delighted that the flowers were delivered early in the day as I had requested. The arrangement was not exactly what I ordered but I understand seasonal availability of flowers and in the end I could say it was better than what I was expecting! My mom was very happy with the arrangement and beautiful perfume of the blooms! Thank you so much to Enchanted staff! The best service !! The flowers were delivered on time and in perfect conditions. I am overseas and ordered flowers late on the 23rd December for my sister and her partner (who live in Cyprus) for Christmas. She received them on 24th December and was delighted with them. Many thanks once again to Paris and her team at Enchanted for their exceptional service and beautiful bouquets. Wonderful, fresh, and beautiful flowers! Delivery was spot on, will do business again with the florist! Easy to order, prompt delivery, and my friends were really delighted with the lovely flowers - thank you so much. Quite easy to order. Delivered on time. Recipients please with the bouquet. Simply first class. I have used this particular florist on several occasions for Paphos deliveries and have found them to be extremely reliable. Good easy to use website and have never let me down. Excellent service !! Ordered flowers for my Mom, twice. Both times perfect on-time delivery and gorgeous fresh bouquets! THank you so much! Always beautiful flowers and delivered exactly on time. I've used Enchanted several time now and never been disappointed. I will continue to use them in the future. Great service, fast and accurate but flowers not exactly as shown on the picture. Fresh and beautiful flowers though. Delivered on time.My friend was very pleased with quality and the picture she sent me the flowers looked great. A beautiful bouquet as always and my Mum was thrilled with her delivery. I've used this florist for years and have always received excellent service. Highly recommend Enchanted Cyprus Flower Lounge. Whole process was easy and excellent. As always. Beautiful flowers. .speedy delivery all in all a great florist . The flowers were beautiful and were there very quickly! Brilliant service. Very happy recipients. <br/>Thank you! I got the wrong address details but fortunately the 2 hotels were next to each other. Owner of florist called me and was ready to collect them and deliver to right hotel. The flowers were amazing and my partner absolutely loved them. Thank you so much, the wreath was beautiful and delivered as requested with short notice. A huge relief as we ordered from the UK and had been let down by Interflora a day before our friends funeral. Would definitely recommend Enchanted. The products were great, the delivery arrived on time and everything was just as I wanted. Super arrangement, delivered on time and delighted my Mother. Also quite reasonable. Good job! As always, excellent product, delivered on time and delivered with genuine warmth and a smile. Thank you once again Enchanted Flower Lounge. My mum said they were the best flowers she had ever received. Great service. Ordered in the UK for delivery to my friend in Cyprus. Was keep informed on progress with the order and the bouquet was delivered within 4 hours. My friend was delighted with the flowers saying they were beautiful. Thank you. Ordered from the UK. Fantastic service, delivered within a few hours of ordering and absolutely beautiful flowers. Will definitely use again. Thank you. Always First Class service! The Best Flower shop in Cyprus! Thank you for your excellent service and beautiful flowers. First time I have used enchanted flowers,lovely well arranged and promptly delivered.,Will use again. Fresh, fabulous flowers and great service! My niece got these special flowers super quick and said they were beautiful thank you! Gorgeous. Delivered on time and perfect. Excellent service . Delivery man was really friendly. The flowers were amazing. Beautiful flowers, and delivered as requested. Thank you. Excellant Services. The flowers delivered were beautiful and lasted 10 days! My mother was over the moon! Beautiful bouquet as always and delivered on Mothering Sunday. Thank you! Beautiful flowers, very fresh and presented in a lovely way, better than pictured. Thank you. Flowers as expected and perfect! Flower choice is superb &amp; deliveries are always exactly when they say they will be. Excellent, lovely flowers delivered on time and made for a happy Mothers Day from afar. A wonderfully personal service. Enchanted make a real effort to make everything perfect. Highly recommended! Beautiful flowers one happy customer. Thank you! Excellent service, delivered on time. Very happy customer. Beautifully presented flowers and chocolates, my mum was delighted and the flowers smell lovely. Perfect service, always reliable. Have used this florist several times for delivery to Cyprus and have never let me down. Lovely flowers at reasonable prices. I live in the UK and sent some lilies to the family of a dear friend of mine who died in Cyrpus, The family said they were so beautiful that they put them on his grave. Thank you very much. I would certainly recommend Enchanted, Cyprus Flower Lounge. Excellent service my mum who lives in cyprus loved her flowers. Excellent as always, the only florist I'll use in Paphos. Absolutely brilliant service. Must admit, had my doubts that the flowers would reach my girlfriend on holiday in Cyprus for her birthday, but flowers were not only delivered when asked, they looked much better than the picture proytrayed online. One very happy girlfriend, thank you. My friend has said they are beautiful so yes I am really pleased :) thank you very much! Excellent service & very impressed when they phoned me up to find out we?? ?re the address was that they could not find at first. The person I sent them to emailed me to say the flowers were beautiful. Absolutely stunning flower arrangement, very happy with the service and will be using again for sure! The recipient of the flowers was absolutely thrilled with them: masses of beautiful peach-coloured roses in their own vase, she reported. Successfully delivered on the agreed day. My mum was really pleased with the flowers, they were of good quality and are still looking good a week later. The recipient was extremely pleased. WOW! Excellent service and excellent products, keep up the good work guys, your my number one Florist shop in Paphos Enchanted. Excellent service. Nothing but positive feedback from both of my friends who received the flowers in Paphos Cyprus. The flowers were lovely and arrived on time. You need to offer just more than flowers for delivery, chocolates or champagne would be really good as well. If I would have had the opportunity to add on to the flowers I would have done. I have used this florist before to send to my friend in Cyprus and their flowers are always lovely and well presented. It is always risky sending flowers abroad without seeing them, but they do not disappoint.. Thanks so much. Mum thrilled. Beautiful flowers and deivery perfect. Amazing service! Order was placed on a Sunday and flowers delivered within 4 hours! Flowers were beautiful, will definitely use Enchanted again. Fantastic service, I was worried that the product on the internet might not be what was delivered but I was wrong, the flowers were delivered as promised and I received a photo of them, they were exactly what I ordered. I highly recommend direct2florist and will use again. My daughter very pleased with the flowers. She sent us a photograph of them, they look beautiful. Many thanks. The flowers were lovely but a shame they were nothing like what we ordered - not even the same colour. Beautiful bouquet and excellent service as always! Thank you ???? Lovely flowers and delivered on time. Thank you,, will use again and recommend. Great flowers as per normal, best in Paphos, maybe best on the island. Excellent service with on-time delivery to the door! Flowers were beautiful and arrived same day! We can't thank you enough. Absolutely beautiful flowers delivered on time as promised. Our friend in Cyprus was overjoyed and completely surprised when she received them on her 70th Birthday and couldn't believe we had arranged it from thousands of miles away back in England. We found your service very easy to use and liked the way the various flower displays were set out when navigating the website allowing us to choose the flowers we wanted. Many thanks once again for a first class service. Excellent service and my friend in Cyprus was delighted with her flowers. Thank you. Beautiful fresh flowers were delivered to my parents in Cyprus within 3 hours of me placing my order. Thank you! Great Service!!! Thank you, I can always rely on you on a special occasions! Flowers arrived in excellent condition on the required date - a morning delivery request was also accommodated. Great job, thank you! Well what can I say!? The staff/owners of Enchanted Flowers once again excelled with this flower delivery for my Mum's birthday. Not only was Mum so impressed with the flowers but Enchanted also went out of their way to accommodate me and deliver them on a Sunday, outside of normal working hours. Cannot praise them enough - thank you! Amazing arrangements and delivery is always on time. Unfortunately my last order had nothing to do with what I was expecting because of the product picture. Fantastic service, beautiful flowers. Guaranteed happiness to the recipient. According to the recipient they were beautiful. Therefore I will use them again. She is sending me a picture of them. The recipient of the flowers said they were very fresh and beautiful. In the photograph they appeared similar to the picture of the arrangement ordered. The recipient of the flowers was very happy with them. Thanks for the oppurtunity to greet my dear friend from another country! Flowers was great and delivery as fast as possible. Just great! Flowers delivered before time i asked , looked gorgeous as picture i chose . Very happy . Bride loved them was really pleased so 10/10 thank you . My mum was so happy with the flowers and they were absolutely beautiful and a massive bouquet. Worth the money! Fantastic bouquet of flowers delivered within 24 hours. The picture of them was superb. Very happy with the service of this florist and the quality of the flowers. the flowers looked beautiful, but they didn't look at all like on the picture. nevertheless the receiver was happy. I would have appreciated a message saying, we don't have the flowers you ordered or something in these lines. Had a thank you email from the recipient with a photo of the beautiful flowers. Many thanks for great service! Ordering flowers online from Australia for a funeral in Cyprus I thought would be a challenging task but it couldnt have been any easier. 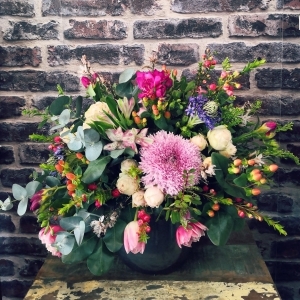 The website is easy to follow, payment easy to make and the florist called the funeral home without me asking to ensure the flowers were delivered on the right day at the right time and kept in contact with me through lovely emails. Highly recommend this florist. Thank you making a hard time easy. Beautiful bhuket, the delivery was made on a right time and really surprised the person! Thank you so much for adding the daisies and sunflowers...i know the sunflowers are a little difficult to get at this time of year. They were both my mums favourite flowers. The bouquet was beautiful and my dad appreciated that you were able to find his house. Thanks again.. Excellent standard of flowers & lots of blooms. Delivered on time & a happy Mum so all good. Would recommend this florist eveytime, thank you. Not quite as large as they looked on the website but still very lovely and the recipient was delighted! Very nice arrangement and I was able to use PayPal. Delivery was as scheduled and able to leave with the neighbors after contacted my wife. Easy to order. Delivered lovely arrangement as per picture. Advised sender that flowers had been delivered, liked that. Very efficient easy to use web site and what you see is what you get. I ordered flowers from the UK and my friend who was visiting Cyprus at the time sent me a photograph of the flowers and they were beautiful. I had asked for morning delivery and although there was no guarantee they arrived by 9.30. Brilliant would definitely use direct2florist again. Every birthday, Christmas and mothers day I use these and they are always first class. Amazing flowers every time! Thank you, beautiful flowers delivered on time. Excellent service as always - flowers beautiful. My Mum was delighted with the flowers which had both full blooms and flowers in bud, so the bunch should last a good while. the delivery also arrived at the time requested. Great delivery and beautiful flowers!! As always a beautiful bouquet. Extra thanks for delivering my order on Mothering Sunday even though I placed the order too late and it should have been the next day instead. Excellent customer service and my Mum told me that the delivery driver was really polite as well. I ordered flowers after being disappointed with a delivery from another online florist. The florist rang to check they were ok to use white rather than pinks roses as should have been specified in the bouquet I had chosen before accepting the order. After a busy Mothers day they had not got any pink roses left. I told them to choose the flowers they thought best. They were delivered a beautiful bouquet the same day by a very smiley delivery man wishing my mother a happy mothers day. I am sure it made up for the disappointment of the previous flower delivery. Thank you. I will always use you in future. Where beautiful flowers and delivered at a reasonable time will Deffo use again. I bought some flowers for Mother's Day and was very pleased. The flowers were beautiful and presented very well. My mum was very happy with them and said the delivery driver was also very pleasant. They were delivered on time. Would recommend to others. Perfect flowers. ++ My mum loved them. So quick and efficient! I worry buying flowers online as you can't be sure of the size or quality. But I sent my Mum some flowers for Monther's Day, she sent me a photo and they look really beautiful! So thank you! My mother in law was very pleased with her bouquet. Thank you. Excellent service, we are very satisfied with the delivery and flowers were lovely. Excellent! First class service. Lovely flowers. Arrived exactly on time. Will definitely use again. Always awesome, quality flowers and prompt, friendly delivery! Excellent throughout and the flowers were beautiful. Worth more than 5 stars. Will definitely use Enchanted Flower Lounge again. Huge Thank you. They arrived in excellent condition, thanks. I will use your service again. Thanks one satisfied customer. So very pleased with the flowers, delivery and service. I wanted to send my mother a specific bouquet, and Enchanted Cyprus Flower Lounge were very responsive and friendly. And yes, they managed it even though I hadn't given them enough time to place a specific order with the supplier. Thank you so much for your efforts and the really lovely bouquet which made my mother's day. The recipient was delighted with her flowers, I chose to let the florist pick the flowers which turned out to be a good decision. Great service, delivered lovely product right on time. I placed my order and it arrived swiftly! Flower arrangement was even more beautiful than expected, really happy! Superb and very beautiful flowers. Absolutely first rate service, ordered the night before and delivered the next morning. Thank you! We have twice used this florist to deliver flower arrangements to relatives staying in Paphos. The quality, service and timeliness of delivery has, on both occasions, been superb and this service is very highly recommended. We are your clients for few years. Thank you for your service! Have used on a number of occasions - really good service and lovely flowers. Beautiful flowers, delivered on time. Thank you for making my parents day specia. Highly recommend and will order again. The flowers we're beautiful and exactly what I had ordered and my special request for the same colour flowers we're adhered to, super impressed will recommend and use again thank you ! Beautiful flowers. First class service. Will definitely use again. Easy to order. Flowers were exactly what I ordered. Delivery was early on the day of my choice. brilliant! Lovely fresh flowers, well presented. excellent the flowers were as seen on the web page. Excellent thank will be back for shure! Super fast service and very beautiful flowers - exactly as described. It's the second time I have used Enchanted and I've no hesitation to use them again. Lovely flowers, , delivered as requested. Fantastic service. Thank you. Always an amazing service and very helpful with our orders. Lovely arrangement and phoned recipient before they delivered. Happy with delivery and display, hopefully the blooms will last a respectable length of time. Great, extremely fast service and a beautiful bouquet delivered. Very happy. Vibrant hand tied bouquet lovely and pretty much matched the website image. Beautiful flowers, delivered promptly with easy and clear online site. Very happy. Looked great and delivered at the correct time. Exactly what we ordered wonderful flower display. Quick delivery and excellent service. flowers looked lovely and were delivered as requested. about to order another bunch now. Another beautiful bouquet from Enchanted, Cyprus Flower Lounge, Paphos. My mum is delighted with her birthday bouquet. Enchanted alway deliver on service and quality. Many thanks. Absolutely super. An email was sent to me keeping me informed of delivery. An excellent service. Excellent service, especially during Christmas/New Year period. sent to my cousin for her special birthday in Cyprus ordering from Scotland ,on time and she was delighted with them and sent me a picture and they looked lovely. Nice bouquet delivered on time as promised. What more could you ask for! My mum said the flowers were lovely and there were a lot of them. was very satisfied with the final product, which looked even better than advertised. Fantastic service. The delivery man contacted me as the wrong people were at the address I had provided and offered to rearrange the delivery directly with the recipient which saved me a lot of back and forth. Adequate would probably be a better description. It was delivered as specified, apparently by a very nice guy, and delivery can be very difficult in Cyprus. Disappointed the arrangement wasn't the colours specified - the florist's choice" seemed to be to do one of the other arrangements! Recipient liked them, so it was ok but as the person who paid €50 for the flowers I'm underwhelmed." Exactly what we wanted for our friends Golden Wedding Anniversary, spot on with the colours. Mum was really pleased with the bouquet. Excellent. Delivered on time. The flowers matched my expectations. Flowers were fantastic, as always! Thank you for the prompt, efficient service and beautiful flowers. The recipient was really pleased. Great flowers. Waited for new fresh flowers to turn up before sending. Great service. Beautiful flowers delivered on time! Made my dad very happy ! Flowers are lovely.....recipient very pleased! Service was excellent! Flowers ordered at approx. 9:30am and delivered by 11am. I was sent a photo of the flowers and they look beautiful. These were for my Mum's birthday who said they were a very nice arrangement of flowers. They arrangement was delivered on time and I was thanked for the 'beautiful flowers' by my friend celebrating her 40th Wedding Anniversary. Very satisfied with the service, thank you. Perfect, as ever. Thank you. Very pleased, ordered from UK to Cyprus for Mothers Day, beautiful flowers and my mum was delighted!! Absolutely excellent. There was a mix up on the delivery. It was dealt with quickly. I would fully recommend this florist to anyone. So nice to deal with a company that genuinely cares about its customers. Thank you. Fantastic service made my mums day. Excellent florist who gives a first class service. Bouquets are always beautifully presented, flowers to a high standard, delivery on time. Went out of their way to ensure delivery was made. Excellent. Great convenient service, good communication and beautifully arranged flowers at a reasonable price. Thank you! If my Mother loved the flowers, and she did, then I'm happy too. Beautiful flowers, fresh as a daisy, no damage in transit and the delivery man was resourceful and friendly. Reports from Cyprus is that flowers were excellent. The flowers were for my mother. She was delighted with them, citing a beautifully coordinated range of colours and variety of blooms. Couldn't be happier. The flower arrangement was just so lovely......perfect!! Beautiful fresh flowers, beautifully arranged. Perfect! Excellent service ! Beautiful flowers !! Great service. All delivered bang on time and even with instructions on how to keep the flowers living longer. Great flower display and very highly recommended. very happy with there communication, as the address could not be found they really endeavoured to locate it. will use again. The recipient was very happy of the quality of the products. Everyone happy. The recipients of the flowers were absolutely delighted with the flowers. They said the Enchanted Flower Lounge was their favourite shop, so that made the surprise even better. I've seen a photo of the arrangement and it did look beautiful. Thank you for your excellent service. Lovely flowers and they have lasted a long time. Flowers were a gift and the recipient was delighted with the beautiful flowers""
Beautiful!! They were for my mums birthday and she loved them! We made a mistake on the order with the contact details but the florist sorted it out quickly and my mum was delighted with her beautiful flowers. Flowers got delivered but delivery driver could not find the address so the florist contacted me in the UK for directions. I have used direct2florist previously for delivery to the same address without problems. Much improved delivery service, and excellent flowers! Apparently the flowers were lovely. The delivery man called before to see if they were in, and when they weren't he delivered them to where they were. Brilliant service! Thank you! Very nice and big booket for my wife's b-day. Very fast and efficient. Thank you very much.